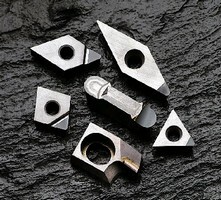 Insert Grade suits machining of non-ferrous materials. Featuring wear resistant properties, Polycrystalline Diamond Grade DA1000 excels in machining of non-ferrous materials, especially aluminum. It comes standard with NF style tip and is available in geometries for turning and milling applications. Mount Prospect, IL - (August 6, 2008) Sumitomo Electric Carbide, Inc., a world leader in the development of Polycrystalline Diamond (PCD) products, now offers the new grade DA1000. This PCD grade combines superior toughness and wear resistance properties that yield tool life advancements of 1.5X that of conventional PCD grades. The DA1000 excels in the machining of non-ferrous materials, especially aluminum. With geometries available for turning and milling applications, the DA1000 can machine a multitude of materials leaving a superior surface finish. The DA1000 comes standard in the economic NF style tip, reducing the total cost per part. For more information, visit our IMTS Booth #F-2668 or contact Sumitomo Electric Carbide, Inc., 1001 Business Center Drive, Mount Prospect, IL 60056, Phone: (800) 950-5202, Fax: (847) 635-9335, e-mail: info@sumicarbide.com, or visit www.sumicarbide.com.